I woke up this morning with a hankering for something yummy to go along with my daily green smoothie. It’s been a while since I’ve baked & it sounded like a fun way to spend a gloomy morning! 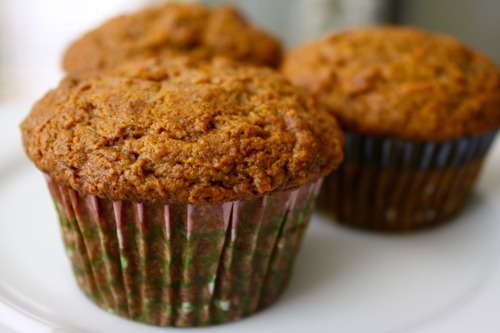 I love sneaking things like carrots & summer squash into sweet muffins & there were plenty of carrots in my CSA share this week, so carrot muffins it was! I found a simple recipe & made some healthy modifications. I added some Bob’s Red Mill whole wheat pastry flour to the mix, & tossed in some raisins, & all my sugars, flours, & mix-ins were organic. In a large bowl combine brown sugar, ECJ sugar, flours, baking soda, baking powder, cinnamon & salt. Stir in carrot & apple; mix well. I was so excited when these gorgeous fresh muffins came out of the oven! I’ve struggled with vegan muffins in the past, turning out dry & flavorless bricks! These lovelies are soft, moist, sweet & delicious. Perfect breakfast treat, or as a sweet snack with afternoon tea!